PIPE是一种符合ASME B36.10M 表格1 和ASME B36.19M的一种圆形截面TUBE.有一些不符合这些表格里面的尺寸的特殊的PIPE,以及圆形TUBE,名义外径对应实际外径. Steel tubes and pipes are made of an alloy of iron, carbon and other elements. Steel tubes and pipes are used in the machine and construction industry, but they also can be found in other manufacturing and industrial applications. In tubular systems steel pipes and tubes are used to transport fluids and gasses for commercial and residential buildings. From a production technology point of view we recognize rolled seamless tubes and pipes and precision drawn seamless tubes and pipes. Seamless steel tubes and pipes are described in the technical specifications. Seamless steel pipes and tubes are characterized by sizes/dimensions and its tolerances, the type of steel and technical and delivery conditions (TDC). 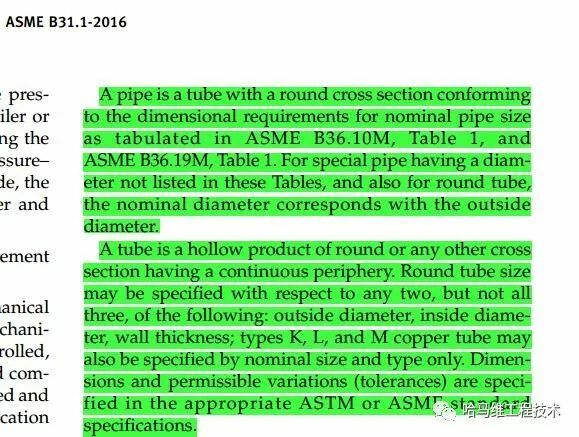 For seamless steel tubes and pipes, individual national standard institutions use various procedures to standardize the data.